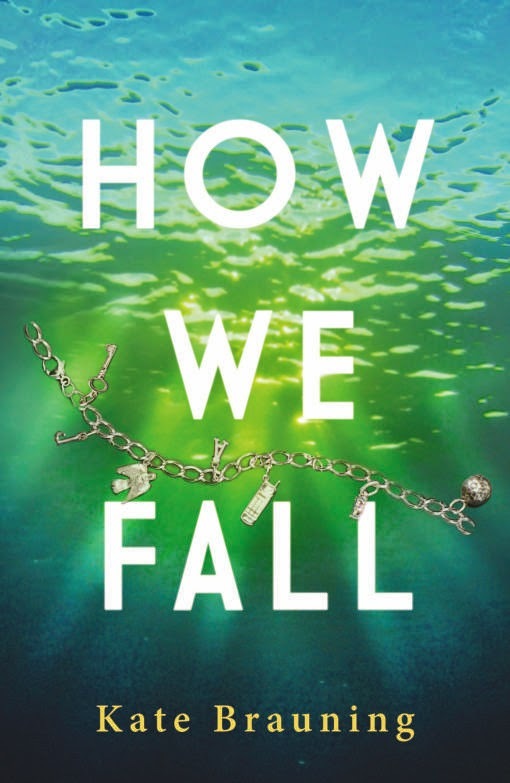 How We Fall by Kate Brauning. Merit Press. 2014. Reviewed from ARC. The Plot: Jackie's feelings for Marcus are intense, but she tries to hide it. Oh, they flirt, and yes, there are stolen kisses. So why can't they just both admit that it's more than flirtation, why not go on a real date? Jackie's afraid, afraid of what people will think. Marcus is her cousin. And, to make matters more sensitive, or at least Jackie more sensitive to what people will think, their families share one home. They live under the same roof. Jackie has few people she can trust or turn to. Her older sister is at college; her parents wouldn't understand, or worse, would over react. Her best friend, Ellie, has disappeared and it's beginning to look like Ellie didn't run away but was kidnapped, or worse. Breaking up with Marcus, or, rather, stopping things, doesn't help. Her feelings don't just go away, and seeing him with a new girl, Sylvia, makes things worse. So Jackie tries seeing someone new, Will. Jackie begins to pore over all emails and messages from Ellie, hoping to figure out what happened to Ellie. And she's surprised when a name turns up in an old email: Sylvia. Could Marcus's new friend have a connection to Ellie and her disappearance? The Good: How We Fall looks at love and lust and desire. Jackie knows full well what other people are going to think about her and Marcus being together, and I'm sure there are readers who won't be able to get over the first cousin romance. As Jackie points out, though, it's not illegal; and at most, it means that in some states they wouldn't be able to marry. There was something so sweet, and heart-breaking, to have Jackie both trying to deny her feelings and love for Marcus, while doing searches to find colleges in states where marriage is possible. Add to it that Jackie is keeping her emotions and thoughts so close, from fear, that she hasn't shared this with Marcus. Jackie's attraction to and love for Marcus is clear, and while the story is told from Jackie's point of view, it also becomes clear that what he feels for Jackie is true. On one level, How We Fall is, simply, about star-crossed lovers. The star-crossed is made more complicated by the unique housing situation. About two or three years earlier (Jackie is now 16, Marcus a year older), the two families decided, for several reasons, to combine households and move in together. For Jackie and her older sister, that meant moving from California to rural Missouri. Her father, a lawyer, now does legal consulting from home; her mother works at the library. Her uncle works in a lawn and garden shop and her aunt takes care of the home, which also involves a working farm. To use Jackie's words to describe her aunt and uncle: "Uncle Ward's opinions were a junk drawer combination of conservative family values, generous interpretations of self-restraint and normalcy, and questionable ideas Aunt Shelly found on the internet." Ward and Shelly have six children, ranging from twin toddlers to Marcus, the eldest. The families share a home -- this isn't sharing land, or a building. It's using the same kitchen, the same living spaces, and trying to balance their values. It's not always easy; you can tell that sometimes Jackie's mother (Ward's sister) is biting her tongue about Shelley's judgments and rules. (Let's just say that Shelley isn't a fan of TV or movies while Jackie is looking to major in film in college.) Jackie has also gone from youngest child of two to an eldest child helping not only with chores, and selling their farm produce, and helping in the gardens and with the animals, but also babysitting her younger cousins. Still, the families make it work. They are happy and functional; but it's also a financial decision. They are living a lifestyle, and in a home, that requires four adults working. But, to be honest, working "less", with a better quality of life, if that makes sense. Look at the father: he can return to law, but he's happier being a consultant. Jackie's mother is happy working at the library, but if the families split, she'd need to get a better paying job. I really loved that this book included this non-typical living argument, and that the arrangement works. And, I also think that more and more readers are going to identify with teens in home situations that are non-traditional. As you can tell, the love story and the setting is what really captured my attention. There is also a mystery going on, the mystery of Ellie's disappearance, and I liked how this was handled. Jackie is not Veronica Mars; her friend lurks in the background, something that Ellie thinks about but, especially at first, doesn't obsess over. It's as time goes by, and it turns into a murder investigation, and Marcus's new girlfriend is revealed to have a link, that Jackie finds herself actively trying to learn more about Ellie's life to figure out what happened. There is also Jackie's own new boyfriend, Will. One of the reasons I like Will is he ends up being such a good, understanding guy. Seriously, whether in real life or a book, when a person is confronted with a situation when they can be cruel or they can be kind -- when they can be judgmental or understanding -- when they be angry and lash out,or listen and be a friend? And they choose kind? It just makes my day; it reaffirms that people are good. And that was Will. Someone who is good. Also, Will is cute. I said that How We Fall is also about desire, and that's true of Jackie and Marcus and Jackie and Will. Jackie is trying to figure out what she wants, and what she feels, and what is love, and what is love -- and it's a bit messy, made messier but the awkwardness of the situation and her thinking she is protecting everyone by not admitting to her feelings for Marcus. And then here is Will and yes he's fun to kiss cause he's older and hot and even with all this he is just such a good guy. And I love that this book shows the complexity of feeling, emotion, and desire that a teen girl feels.